Down a secluded Tesuque road, nature unveils an updated country home with guest house on 2.5 acres. This 5,192 sq. ft. modern tri-level country estate possesses captivating views from the Sangre de Cristo mountain range to Antonito, Colorado. This refined property was created to allow for the environment to look found, not made. The 4,182 sq. ft. 3 bedroom, 4.5 bathroom main house offers walls washed with pigments of stark white American Clay and dark slated gray. Exposed weathered beams and vigas on ceilings allow the eye to rest peacefully in each room. Radiant heat added to kitchen, dining, living and media rooms. New electrical wiring and modern lighting throughout. Runtal heating system in Master bedroom, sitting area and bath. Bright airy kitchen has been completely updated. Extensive flagstone patios off dining room, and both guest bedroom suites. The 1,018 sq. 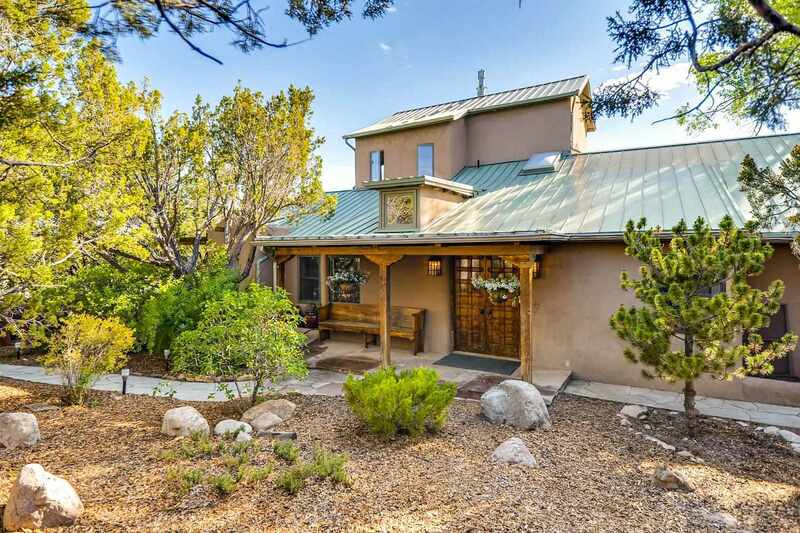 ft. 1 bedroom/1bathroom guest house has a kiva fireplace in living room and a wrap around flagstone patio with stunning views of the Sangre de Cristo mountains. Directions To Property: Hwy 285 North To Tesuque/Opera Exit 73. Right To Tesuque Hill Road. Up Hill. Follow Signs To #19.